A friend of mine has begun posting photos of gas pump digital displays after each fillup, which costs her an astonishing $70-$80 now. I noticed that she’s been consistently buying the middle grade of unleaded gasoline, labeled ‘Plus’ at the Chevrons she frequents. As someone who invariably buys the cheapest gas possible, I started wondering if the higher grade was strictly necessary. Don’t use premium fuel if you don’t have to. If your car specifies regular fuel, don’t buy premium under the mistaken belief that your engine will run better. The only difference you’ll see is about 20 cents more per gallon. Most cars are designed to run just fine on regular gasoline. Even many cars for which premium is recommended will run well on regular. We have found that the differences are imperceptible during normal driving. Check your owner’s manual to find out if your engine really requires premium or if you can run on other grades. Your vehicle is designed to use “Regular” unleaded gasoline with pump (R+M)/2 octane rating of 87. We do not recommend the use of gasolines labeled as “Regular” that are sold with octane ratings of 86 or lower in high altitude areas. If you are experiencing starting, rough idle or hesitation driveability problems, try a different brand of unleaded gasoline. “Premium” unleaded gasoline is not recommended for vehicles designed to use “Regular” unleaded gasoline because it may cause these problems to become more pronounced. One more web search confirmed that Chevron “Regular” gasoline is 87 octane, and “Plus” is 89. 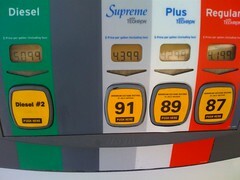 In my friend’s most recent gas pump photo, Plus was listed at $4.639 per gallon, Regular at $4.439. That’s 20 cents per gallon she can save, just by switching gas grades. If you’re currently buying a higher gas grade, double-check your owners’ manual to make sure it’s recommended for your particular vehicle. And even if it is, you might consider trying 87 octane gas anyway, since as CR says, “the differences are imperceptible during normal driving.” The savings will add up! If premium is within $0.10 a gallon of regular, I always buy premium, because it increases my mpg by roughly 10%. For my car, that’s getting an extra 30 miles for around $1.30.